Traditionally a sailing and social club, Marconi wanted to branch out enabling more people to enjoy our quiet and accessible waters, using only natural power beyond just the wind (as occasionally there may not be any!). Rowing was a natural choice. 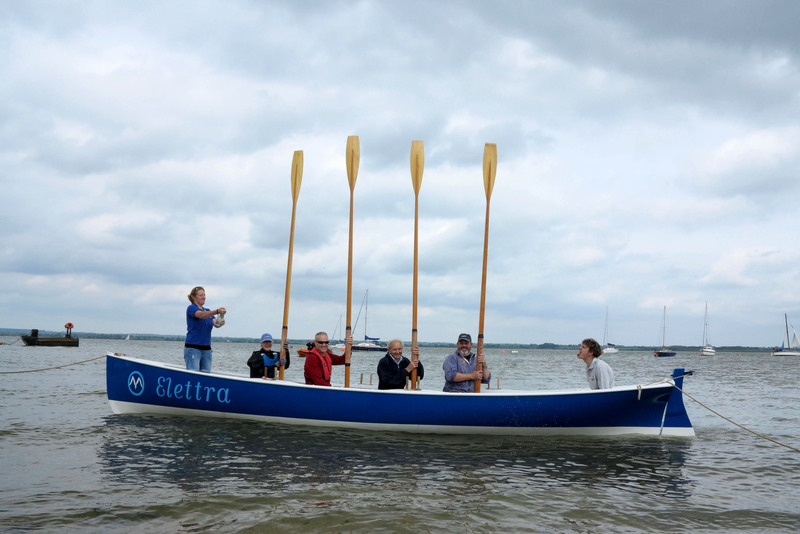 Our first venture was to order a traditional style Rowing Gig, as there were becoming more about in the River Blackwater and other East Coast estuaries. The Harkers Yard Gig design is based on the traditional Cornish Pilot Gigs and has 4 oars people plus cox, and utilises traditional woodworking and construction techniques laying up a thin wooden ply around a mould to produce a lightweight seaworthy boat. Our Gig Elettra was number 15 to be built and we launched her in 2016. To reflect the roots of our club, it was named “Elettra” after Guglielmo Marconi’s daughter (now “La Principessa Maria Elettra Marconi Giovannelli”) and his floating laboratory and show ship. There is a winter series of Harkers Yard Class Gigs, typically 14 local clubs compete roughly every 2-3 weeks at local coastal rowing venues. On 26th February 2017 Marconi hosted its first non-sailing event. Winter rowing sounds cold but I can assure you you soon warm up – especially when racing (I’m in shorts and tee shirts sometimes, but multi-layer clothing is the best way to adjust accordingly). Through this winter series we have converted sailing skills of many members to also include Rowing and especially Coxswain skills – taking responsibility for a team of rowers means the boat is only manoeuvred, turned and stopped by verbal command, so we’ve had to adapt to this as well as further our teamwork! Have a look at our mens team getting it’s best ever result, half way up the field, at the brightlingsea race this year – Racing is hard work but can be very exciting at close quarters – on starts and rounding marks. We have also found that this sport is more popular with ladies, many of the other teams have full crews for their ladies and mixed teams, they are often more closely contested, effective rowing is as much teamwork and technique as it is strength. So “Pulling Together” rowing is yet another way for Marconi’s self-sufficient team approach to keeping afloat on the water. Sneaking up through shallows and reeds on wildlife such as large flocks of birds and Maylansea’s (bob, colony, or herd of?) seals. As the Gig has shallow draught it can travel in just an paddles width of water. A lovely -3 degree still January morning when it had been much colder overnight, the outgoing flat calm estuary tide taking sheets of ice past Marconi buoy. We found that icebreaking by gig is good training, it slows you to about half speed, but makes a most unusual noise, as do the oars plunging through the ice together four at a time. We will be introducing casual summer cruises for all abilities (we don’t have to row fast all the time), evening rows as the days lengthen, and may even join the sailing races unofficially to see how wind compares to human power, and learn more about tactics, as those learnt sailing do not always seem to transfer to rowing! Also we will enter other fun events throughout the year including our regulars in the Maldon RNLI fun race, to long distance multi-class races such as the “Great River Race” in London. We will be afloat for “Try Rowing” sessions on the open day, some weekends, and the Cadet fortnight, where we hope to be able to borrow other club’s gigs and loan ours back to encourage more fun afloat. Whilst the Gig was our first human powered craft, we recognise that its large oars etc may not suit the younger cadets, and we may not always be able to get an experienced cox’n or a full crew. Hence we continue to invest in other paddle sport and rowing craft, in 2016 we also purchased 2 1-person kayaks, which we have found better than motorised boats for up-close teaching and encouragement during our cadet sail training. We are also expanding to Paddle Boards, which complement our rowing and windsurfing activities. So if the wind dies on a weekend, or the forecast is too light for your type of boat to sail, you can borrow other classes of club sailing vessels or go out for a paddle or row with us, contact the OOD (Officer of the day) for access or myself (Rowing Captain) if you’d like an impromptu trip in the Gig. We also aim to do some exchange visits with some of our land-bourne rowing colleagues, and hope to do the same with some traditional Cornish Gigs as time progresses. Keep an eye on the web site as we add hints, tips, and racing guidance. Our events are shown in the club’s web calendar, as are all our social events. I hope we at Marconi can help float your boat more often, and look forward to welcoming you out on the water – sailing or rowing, young or old, experienced or novice!